Seascape’s interior design exudes luxury and sophistication. Every residence has the same high specification and north-facing aspect, each designed to maximise the light and views available throughout the apartment. Seascape has been thoughtfully designed so every apartment faces north, with the core and services located at the rear of the building and the megabrace structure on the eastern and western facades. This efficient design allows for floor-to-ceiling glass along the entire exterior face of each apartment to maximise the views and natural light. The lower levels enjoy vibrant urban views of Britomart while the upper apartments boast some of the best views in Auckland of the Waitemata Harbour and Hauraki Gulf beyond. 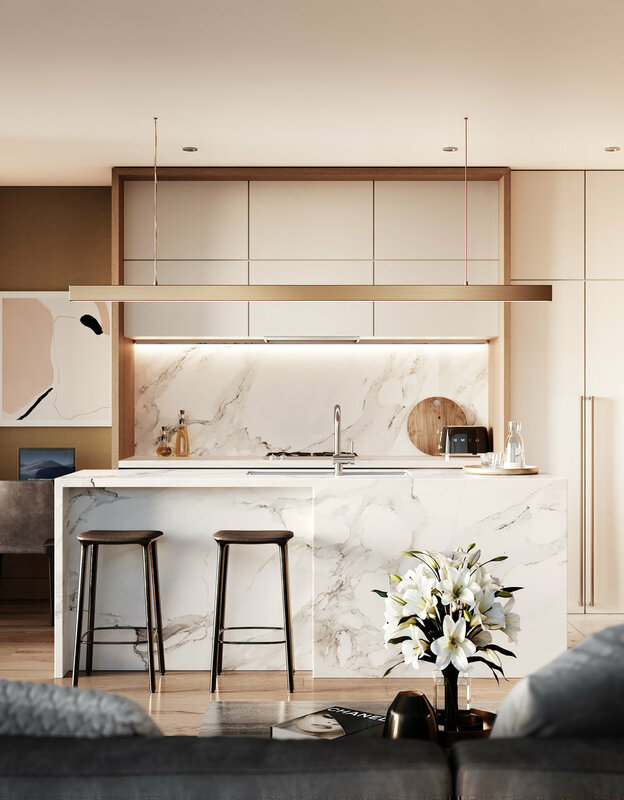 Featuring a luxurious combination of natural-look timber panelling and designer wall coverings, the apartments in Seascape have an exceptional level of design and attention to detail throughout. This design is utilised to great effect in integrated wardrobes and headboards in the master bedroom, and a feature wall in the open plan living. Recessed LED strip lighting and sleek air-conditioning vents create a high-tech look to the ceiling. Peddle Thorp have designed a dynamic living experience that allows residents in every apartment type to enjoy outdoor space even on the windiest of days. With internal sliding joinery and a level transition, these ‘winter gardens’ function as both a generous enclosable balcony or an extension to the open plan living. At every turn, the apartments at Seascape deliver a luxurious living experience worthy of the amazing location. The rainwater shower, wall-mounted designer tapware, underfloor heating and level-entry shower create a subtle touch of luxury to the bathrooms while the bespoke vanity with large drawer and mirror cabinet provide functional storage. The kitchens at Seascape have a contemporary design with refined detailing and a minimal palette of luxury materials.